A lot of games these days have pretty weird characters. BioShock is one of them with its own kind of weirdness, especially the characters. This is a large 184-page hardcover concept artbook published by Dark Horse. The concept art features the environment, characters, weapons and other props such as propaganda posters. I like the environment art for the floating city of Columbia. It's beautiful yet mysterious. 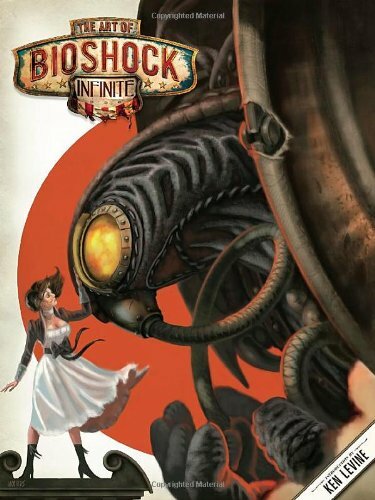 There's plenty of character art, that of Elizabeth, Booker, Songbird and many of the grotesque and mechanical enemies, Heavy Hitters It makes you wonder about the twisted minds of those in Columbia who created these monstrous beings. They have included quite a bit of discarded art that couldn't make it to the game as well. The art is accompanied by some commentary and annotated handwritten text. No much. If you've not played the game, it's quite impossible to know what the game is about by looking at the art. It's a nice companion video game artbook, but overall, I felt the art is not as refine as Deco Devolution: The Art of BioShock 2, but this is also sort of a different title. A Kindle edition for this is also available. You can check out the preview pages on Amazon.